Technology in all of its wonderful and confusing forms has entered every facet of our lives, hovering over us as an invisible, ubiquitous presence. But two artists at Paoli’s Abel Contemporary Gallery are harking back to a pre-digital world, exploring the idea of artists as craftspersons and working with their hands to create singular objects. New Works, open until March 3, is an exhibit from potter and educator Joanne Kirkland and printmaker Nick Wroblewski. Kirkland, a longtime ceramic artist and instructor of 13 years at Madison College, displays an array of functional pottery in the form of mugs, pitchers and other housewares. 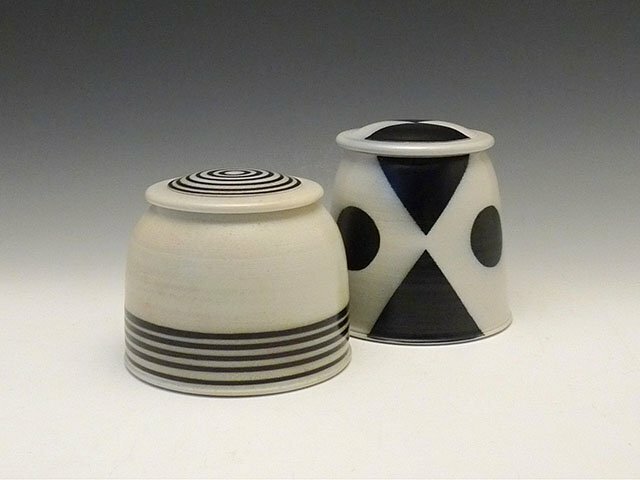 Many of her ceramic pieces are stark and geometric, repeating and replicating lines that eventually fan out or fold into themselves. The result is a quiet and almost mystical aesthetic. Other examples of Kirkland’s work maintain the same ageless simplicity while weaving in small amounts of personal narrative. On one piece, a flock of dark chickens is pecking in the foreground while foxes appear in the background. Kirkland once saw one of her backyard chickens carried away by a fox. Wroblewski’s woodblock prints make an excellent pairing with Kirkland’s ceramics. A longtime printmaker, Wroblewski attended Bennington College in Vermont and has been honing his craft for 20 years. 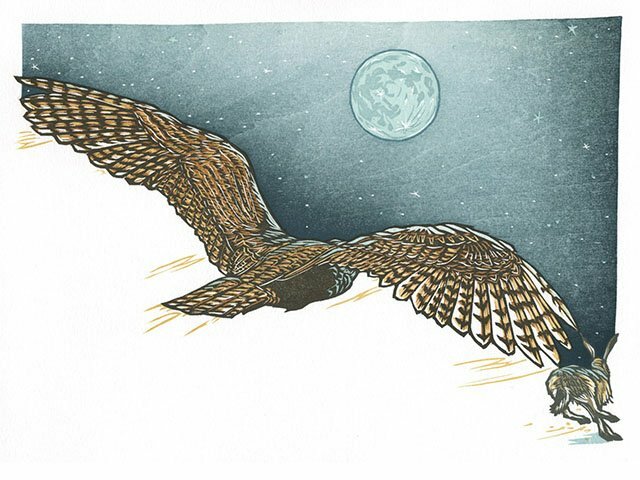 His pieces in New Works actually double as illustrations for a children’s book called Hush, Hush Forest, inspired by the Minnesota wilderness that Nick knows intimately. “That’s the original reason the publisher approached me, because they saw the relationship between what I was trying to capture, very local landscapes, and the author [Mary Casanova], who’s from northern Minnesota,” he says. Wroblewski’s prints are relatively small, at 11 inches by 14 inches, but their size still allows the viewer to inhabit the rich Minnesota dreamland he has so carefully crafted. One print contains a hunched-over black bear walking across a fallen birch trunk. The creature’s lush, textured fur dominates the frame and clashes with the smooth, almost empty surface of the night sky. In another, a stand of barren trees surrounds a tiny cabin in the distant forest, as their shadows are thrown like skeletons across the frame. In a third, echoing Kirkland, a fox creeps down a snowy hill that’s beginning to show the first signs of spring. The trees are white, and the orange light of a sunrise bathes the scene. It could have taken place 100 years ago, or yesterday. According to Wroblewski, creating these pieces was time-consuming, but that’s something he hopes viewers can take away. Wroblewski wants viewers to gain an understanding of the slow process he undertook to illustrate the book. “I hope it reminds people that there are slower, more hand-carved approaches,” he says. In its penultimate show before moving to a new location in Stoughton, the gallery is debuting two other shows alongside New Works. Nocturne features the work of nine different artists in a variety of mediums as they address the theme of night, both figuratively and literally. From cryptic ink prints of vessels in the inky blackness of space, to a subdued low light screen print of a forest caught in the gloaming, to strange pieces of sleek, darkly earth-colored ceramic work, Nocturne is a beautiful and quietly unsettling group effort. Abel Contemporary Gallery has a tradition of featuring more experimental works in the gallery’s Cooler space. The former creamery building includes a strange, close-corners space previously used for cold storage, perfect for the single installation of a small solo show. Chelsea Thompto, a master of fine arts student at UW-Madison, utilizes the Cooler for her visually arresting commentary on transgender issues and politics, Productive Bodies. Thompto’s multimedia work features a video where jagged, punctured geometric shapes shift seamlessly between forms, often depicting violence to human bodies. Thompto is comparing trans bodies with the Mississippi River, attempting to connect how both types of bodies face violence. Thanks to the Wisconsin State Journal for their write-up introducing Karl and Zac!